Powerbar Ride Chocolate & Caramel Bar is a delicious tasting all-rounder, combining cutting edge sports nutrition with the taste of your favourite chocolate bar. 1 bar per day during and after sports. Compound Chocolate (20%) [Sugar, Vegetable Fat, Fat-reduced Cocoa Powder, Protein-Enriched Whey Powder (Milk), Skim Milk Powder, Soy Lecithin, Emulsifier (476), Flavour], Caramel (15%) [Wheat Glucose Fructose Syrup, Sugar, Vegetable Fat, Sweetened Condensed Skimmed Milk, Butter Oil (Milk), Emulsifiers (407, 471), Salt, Flavour], Wheat Glucose Syrup, Milk Solids, Maltitol Syrup, Humectant (Glycerol), Soy Protein Crisps [Soy Protein, Tapioca Starch, Salt], Invert Sugar Syrup, Soy Protein, Peanuts, Oat Fibre, Almond Butter, Inulin, Fat-reduced Cocoa Powder (2%), Maltodextrin, Flavour, Vitamins [Ascorbic Acid (Vitamin C), dl-alpha Tocopheryl Acetate (Vitamin E), Niacinamide (Niacin), Pyridoxine Hydrochloride (Vitamin B6), Riboflavin (Vitamin B2), Thiamin Hydrochloride (Vitamin B1), Cyanocobalamin (Vitamin B12)], Calcium Carbonate, Salt, Magnesium Carbonate, Salt, Emulsifier (Soy Lecithin). 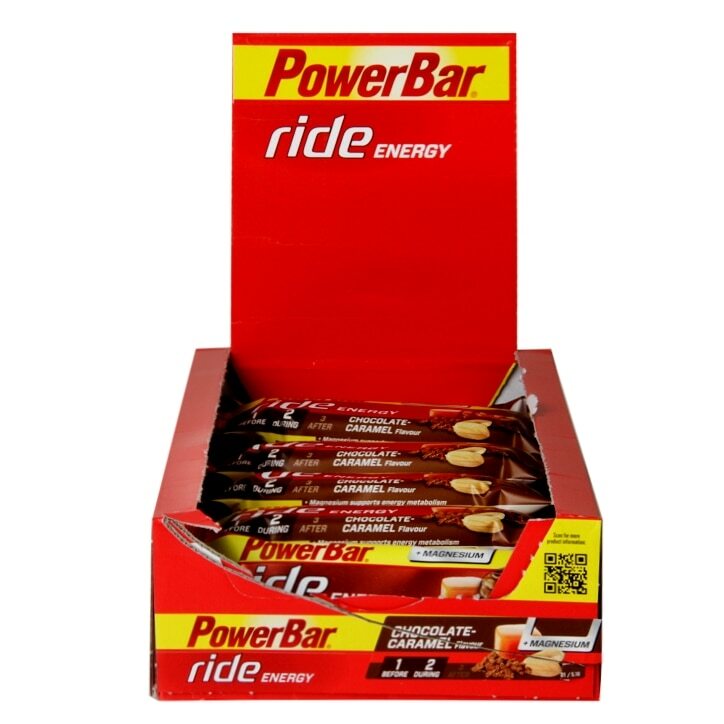 Powerbar Ride Chocolate & Caramel Bar is rated 4.1 out of 5 by 8. Rated 5 out of 5 by philz from Great tasting and excellent value Can't fault these, they taste great and contain a reasonable amount of protein. Ideal as an alternative to a Mars Bar if you've got a sweet tooth like me. Rated 4 out of 5 by Stevo5 from Great service, product average Delivery was very fast and efficient. Product is not bad but given the price I paid I'm very happy. Rated 4 out of 5 by abella from great tasty bars I always buy these bars great for a quick breakfast keep you going all morning, good value for money. Rated 5 out of 5 by nikki88 from delicious great tasting bars - we take these mountain biking with us and they are great for refueling mid ride. they don't have the tackiness of protein bars, they are much closer in taste to a real chocolate bar. Rated 4 out of 5 by Jarro from Does the job I use these on bicycle rides longer than 1.5 hours or as a pre-exercise snack.